In 2009 we ran a very special trip for a client whom we may not name to search for the fabled Yeti! Yes, we actually went looking for the Yeti and by all accounts almost found one. But that is a story for another day and another camp fire. After years of waiting we now have permission to bring you that fabled itinerary and take you into the area to see for yourself and perhaps come face to face with the legendary Abominable Snowman of the Himalaya. If however, at the end of your trek you still have doubts about the existence of the Yeti, you will at least, have trekked in some of the most remote wilderness areas and seen some spectacularly splendid mountain views. Fly form Kathmandu to Pokhara, drive to Beni and then trek up the Myagdi Khola (river) valley to Doban and then finally to Kunaban Kharka (literally meaning “the grazing ground at the forest corner) and then return via the same route to Pokhara and then Kathmandu before heading home. Mt. Dhaulagiri, the seventh highest mountain in the world at 8167 m. dominates the skyline providing near constant company and dwarfs the other surrounding peaks which are no less impressive. The villages are friendly, although few and the villagers are not used to seeing many outsiders in this corner of Nepal visited by few people. Day 01 Arrrive in Kathmandu meet our representative and transfer to your Hotel. Overnight at hotel on breakfast basis. Day 02 Free day in Kathmandu to make final preparations for your trek. If you feel that you are adequately prepared sightseeing tour of Patan Durbar Square, Swoyambhunath and Bodhnath. Overnight at hotel on breafast basis. Day 03 Fly to Pokhara and drive to Beni (1000m). Day 05 Trek to Dharapani (1565m). Day 06 Trek to Muri (1850m). 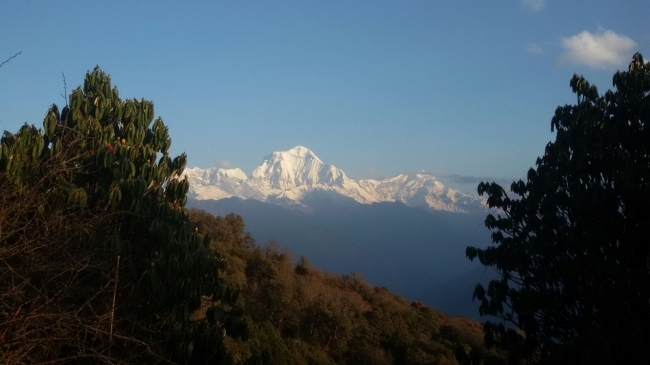 Clear views of Dhaulagiri are available. Day 07 Trek to Baghar (2050m). Day 08 Trek to Doban (2630m) along a very difficult path where you may need to rope up. Day 09 Trek to Kunaban Kharka (3500m). Day 10 At Kunaban Kharka. Day 11 Trek back to Doban. Day 12 Trek to Baghar. Day 13 Trek to Muri. Day 14 Trek to Babichaur. Day 16 Fly to Kathmandu and additional sightseeing. Day 17 At an appointed time transfer to the airport for your departure from Nepal.